This 14-story apartment house has one of the most desirable locations in the world as the co-anchor with The Frick Collection of what is widely regarded as perhaps New York's most impressive sidestreet.The Frick Collection, directly across 70th Street from this building, of course, is the most magnificent small museum in the United States and has a very large garden on Fifth Avenue as well as another large one to the east where it demolished the very fine townhouse of another famous at collecting family, the Wideners, that had been part of a very distinguished row of mansions, several of which are now occupied, at least in part, by very major art galleries such as Berry-Hill, Knoedler and Hirschl & Adler. 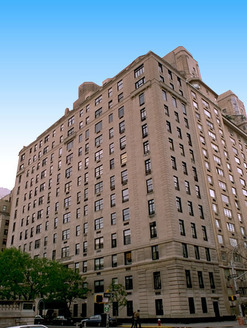 East 70th Street is also noted for many other fine mansions and institutions between Madison and Lexington Avenues.This 16-unit cooperative building is relatively modest by Fifth Avenue standards, but because of its small number of units and open views because the Frick is a low-rise "palace," it is a very desirable address. Upload Cover Letter. Please see attached for more information. Complete and sign Purchase Application (enclosed). Financial Statement and Itemized Schedules-3 pages (enclosed). To be submitted along with all supporting documentation. Complete and sign Estate Requirements (enclosed). Complete and sign Corporate Transfer Fee Form (enclosed). Upload Four (4) Personal Letters of Reference. Upload Three (3) Business Letters of Reference. Upload Landlord Letter of Reference. Upload Bank Balance Confirmation Letter. Upload Employer Reference Letter stating salary or W-2 Form. Copy of Alteration Agreement (enclosed for informational purposes). Complete and sign Co-Op Tax Abatement Letter (enclosed). Complete and sign Window Guard Form (enclosed). The disclosure documents must be completed in their entirety and submitted for review with the Board Package. The Board Package will not be sent to the Board of Directors for review unless the Lead Based Paint Disclosure documents are included. NO EXCEPTIONS will be made. Enclosed is a summary of the Lead Based Paint Disclosure Information.